I’m on the outside looking in. I am within and without. The exquisite floating city of Venice, whose Grand Canal snakes through it like a question mark, lies tantalisingly close across the lagoon. Resisting the tourist trap, I am in Mazzorbo, inhabitants 250, a tiny unassuming sister island. The pleasures of Venice are close, but there’s a sweetness in the yearning. I can see her bright lights, beautiful bridges and the thrusting rust-coloured Campanile in St. Mark’s Square piercing the pale blue sky. From a distance she is perfect – ravaged by time yet uncorrupted by modern man. I imagine her streets are empty, leaving me free to roam. But it’s summertime in the city and the air is thick and hot. The streets are sticky with tourists, the bridges a moving mass of clicking cameras. Taking a boat across the lagoon into Venice one afternoon, the crowds are so stifling, I find it hard to find beauty in the most beautiful of cities. Desperate to see it through fresh eyes, I pace the streets in search of solitude. I find it in the form of a pale pink Bellini taken on the terrace of The Gritti Palace hotel overlooking the Grand Canal. Peaches are in season, and the fizzy nectar is so fresh, it immediately revives my flagging spirit. The great and good of Venice seem to be assembled here. Everyone is well dressed and hoping to be noticed. 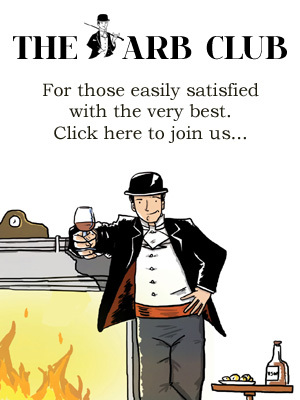 I half expect to spot a linen clad Dickie Greenleaf sipping a Negroni at a neighbouring table. 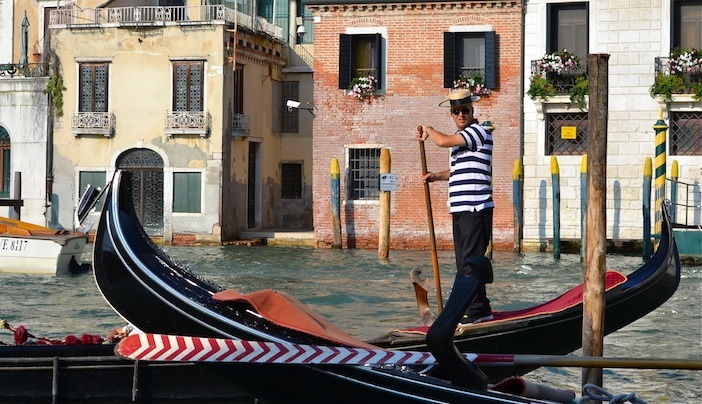 This is how to do Venice in style. Back in Mazzorbo all is calm. In youth one seeks out energy, life and vigour. One looks for madness and motion, music and mayhem. But as the sands of time sink further into the bottom of the glass, something shifts. And while still keen to live urgently and vibrantly, a premium is placed on peace. My home for the next two nights is Venissa, an adorable six-room guesthouse owned by Prosecco makers Bisol. Dotted with brilliant purple artichoke flowers, in the middle of the walled property is a one hectare vineyard punctuated with a 14th century bell tower and planted with Dorona grapes, which take their name from the golden colour their skins become when fully ripe. For a wine lover this is a sacred site, it being the only Dorona vineyard in the world. 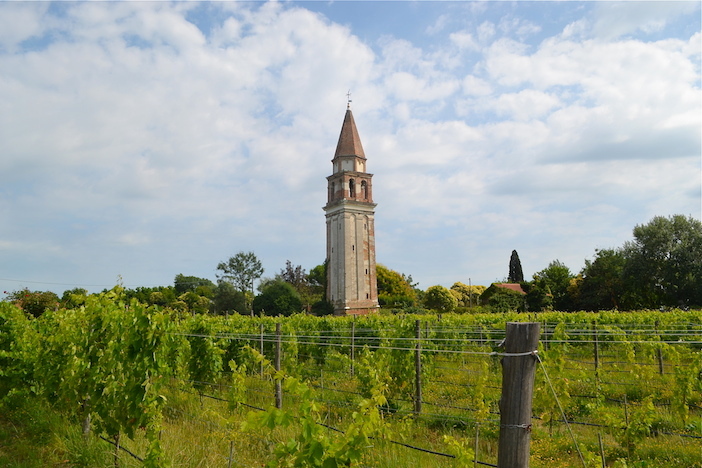 Having been grown on Venice’s lagoon islands up until 1400, Dorona all but became extinct until the Bisol family decided to revive the ancient variety in 2002, planting the Venissa vineyard with 4,000 Dorona vines from which they make liquid gold. Growing grapes in Mazzorbo is no mean feat. During times of “aqua alta” when the tide is high, it’s normal for the vineyard to be submerged up to its knees in water. Though being by the sea has its benefits – the salt in the air finds its way onto the grape skins and can be detected in the wine, which has an appealing savoury edge. 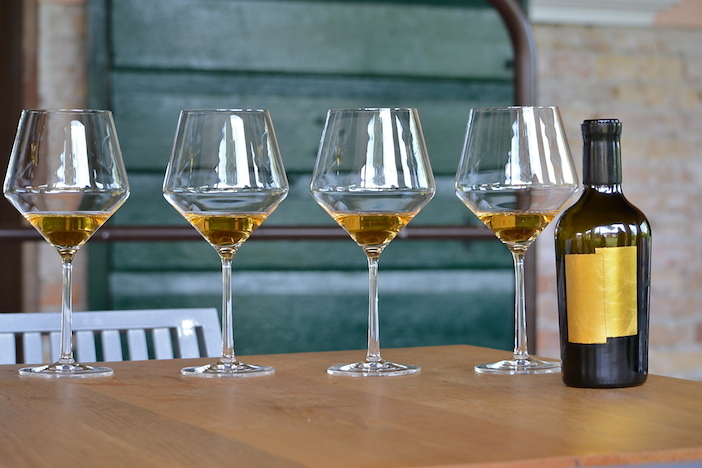 Named after the guesthouse, Venissa gets its golden colour from being macerated on its skins for 24 days, leading to notes of baked apples, aniseed, honey and mandarin. Just two vintages (2010 and 2011) of the wine have been made thus far, with under 5,000 numbered bottles produced each year. Using Murano glass bottles, in place of a label is a single sheet of gold leaf applied by hand, meaning each bottle is slightly different. Based around tasting menus, the offering at the restaurant is tweaked daily, with dishes coming and going depending on what’s in season. Priced at €85 for six courses and €95 for eight with the option of wine pairings for an additional €45, the majority of the wines on the 200-bin list come from the Veneto, Alto Adige and Friuli with just a smattering sourced from outside of Italy. At dinner on my visit, we were treated to a plethora of painterly plates including cloud-like creamed salt cod, juicy squares of red mullet with edible flowers in a rich sauce made from the fish’s own liver, crispy croquettes of local fish goby, pea green vegetable tortellini and sunshine yellow, perfectly al dente spaghetti dusted with saffron and jasmine that would put a smile on the iciest of faces. 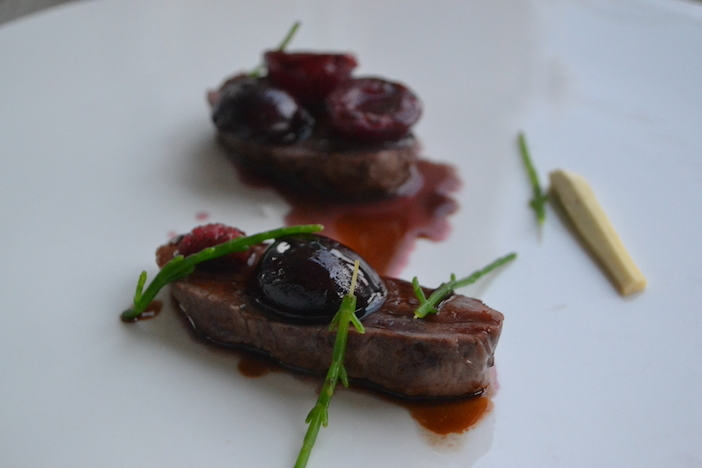 Fortunate enough to be dining on the day of a meat delivery, rounding off the meal were two tiny slices of smoked venison served with Morello cherries and samphire that was almost heartbreaking in its beauty, leaving me willing to kill Bambi for more. The next morning, before the sun began its fierce ascent, I crossed a wooden footbridge to explore the neighbouring island of Burano, land of lace and pastel-coloured houses so bright, it’s as if they’ve sprung from a paint box. Ambling through the streets, it feels like everything has been cranked up to the highest level of saturation on Photoshop – canary yellow and bubblegum pink façades stand side by side making the island appear like a toy town, each house an explosion of colour blazing bright above the water. The smell of freshly baked biscuits wafts through the air filled with the animated banter of locals weaving among bobbing boats. The pace of life here is languorous, anaesthetised even. 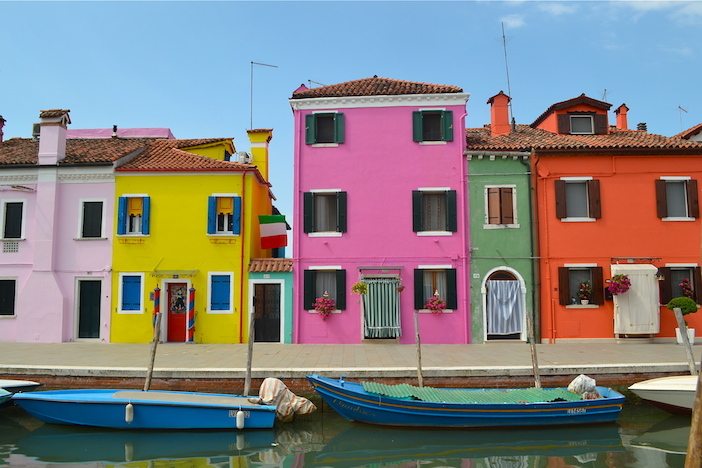 French designer Philippe Starck fell so deeply in love with Burano he bought four houses on the island, where he lives for three months of the year seeking solace and inspiration. Having latched onto its charms, the Bisol family are due to open three guesthouses on the island next year, offering the rooms to visitors keen to frame their trip around a meal at Venissa. Dazzled by the floating rainbow of Burano, on my return to Mazzorbo I’m ushered onto a speedboat. The sun now high in the sky, she cuts through the lagoon like a firework. With Venice coming sharply into view, there are few times I’ve felt more alive. Bypassing La Serenissima, we instead moor up on the fertile island of St. Erasmus, known as the orchard of Venice, home to ebullient Frenchman Michel Thoulouze. Having made his money in the media, running a series of French TV channels and becoming a flea in Rupert Murdoch’s ear – the pair were in constant competition – Thoulouze is enjoying a second life as a winemaker. The fruit of his labour, Orto (meaning orchard in Italian), is a refreshing blend of native Italian white grapes Malvasia, Vermentino and Fiano grown across four hectares on the island. Over copious glasses of Orto and piping hot courgette and Parmesan arancini, Michel regales us with his life story. Picasso-like in appearance and braggadocio, he tells of the time he had dinner with Serge Gainsbourg and Jane Birkin. Refusing to sit at the table, Gainsbourg spent the entire night fanning himself and necking beer by an open fridge. Another yarn involved a time when as a spunky young journalist, having interviewed Brigitte Bardot at a hotel in Paris, her PA later asked Michel if he’d like to go up to Bardot’s room to play Gin Rummy. He refused as he didn’t know how to play. Topping both tales was the discovery, from a newspaper cutting in the winery, that Michel dated Top Gun actress Kelly McGillis for two years during the height of her fame. “The biggest compliment she ever paid me was when she told me that I make love like a woman in a man’s body,” Michel reveals, his eyes sparkling and lips locked around a Gitanes. He’s smoked at least twenty since we arrived an hour ago. Jumping back on our speedboat and waving Michel goodbye until he disappeared from view, I reflected on our meeting. This was a man content with his lot in life and at ease in his own skin. A man seemingly afraid of nothing who had living down to a fine art. Returning to the tranquil shores of Mazzorbo, before my final night’s rest, I opened my window to observe the evening unfolding. Two men were fishing by the water’s edge. In the black of night, all I could see were the emerald green lights at the end of their rods darting about the lagoon like fireflies. 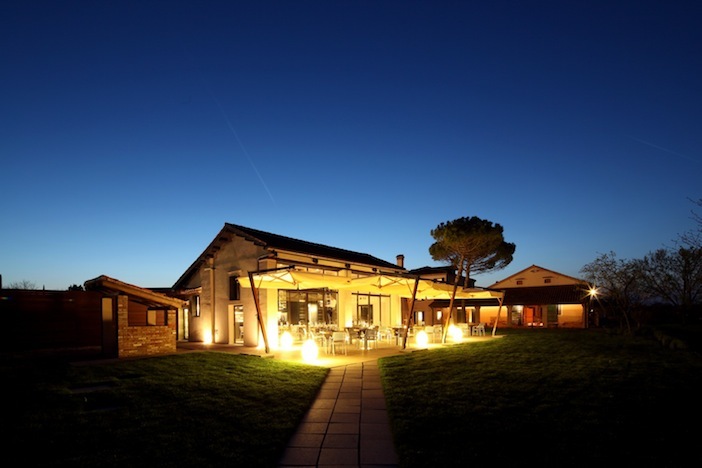 For more information about Venissa, visit the website. All photographs by the writer.